This kind of small act of near random #ds106 connection will not increase enrollments, will not “fix” education, will not improve institutional metrics… yet I just cannot let it slip by without a small “wow”. And the ironic thing is that the tweet in which I saw it came into my view about 5 minutes before I had to jump into a video call to Cape Breton University by invitation of Grant Potter. I was asked to say some encouraging things about openness to a faculty group there. While I am still musing on the takeaway from Catherine Cronin’s OER16 keynote caution about “amazing stories” not being enough to convince people to share openly… I did so anyway because I do believe we have a case to make about shifting teaching to a place where the audience is more than the teacher giving out grades. Bonnie McCarroll, born Mary Ellen “Dot” Treadwell (1897 – September 29, 1929), was a champion rodeo performer and bronc rider most remembered for her death at the Pendleton Round-up in Pendleton, Oregon. She also excelled in steer riding, bulldogging, and automobile jumping. 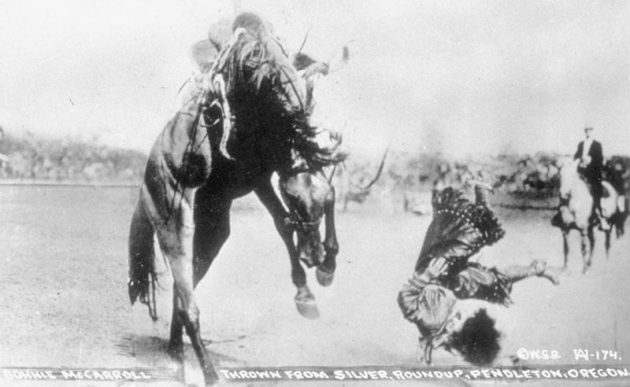 In 1915, her first year of rodeo competition, McCarroll attracted national attention from a photograph taken of her being thrown from the horse named “Silver” at the Pendleton Round-Up. In her career, she performed before kings, queens, such dignitaries as U.S. President Calvin Coolidge, while he was vacationing in the Black Hills of South Dakota in 1927, and before countless rodeo fans worldwide. After her death, rodeo officials instituted safety regulations and eliminated bronc riding as a women’s sport. 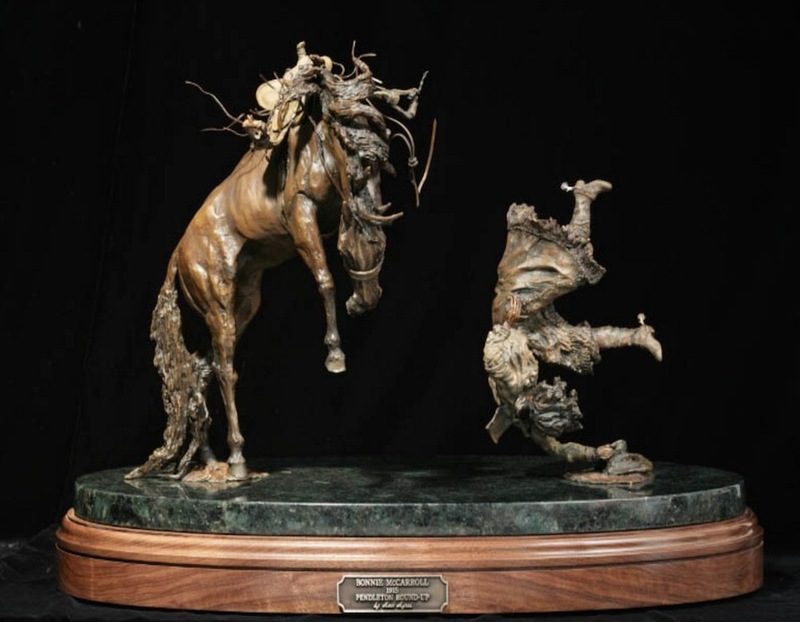 Ann is a bronze sculpture artist from Bridgeport Texas who specializes in works depicting cowgirls (see her web site at http://annayresbronzes.com/). It’s not a total fluke, I would guess Ann does some regular searches on the figures she uses in her art, but still, here we go again, with an unexpected connection, however small, generated because Ron shared his art in the open. It would not be possible without an open web. Keep that in mind was other mega entities are praised for “eating the internet“. Thanks Ann for finding out little corner of the web. I found an account of how the Rodeo Association of America used the picture of Bonnie McCarroll being thrown, and also made a ds106 post. Thanks so much for sharing your art stories, Ann. I’ve been close to Bridgeport a few times on cross country routes, usually headed toward Amarillo from those big texas towns. Next time, I will turn off of highway 287!